Welcome to where the city meets the sand—one of LA’s best settings for a meeting, milestone celebration or special event. We’re talking over 17,000 square feet of indoor function space as well as creative outdoor spaces that include our gorgeous oceanview pool deck. 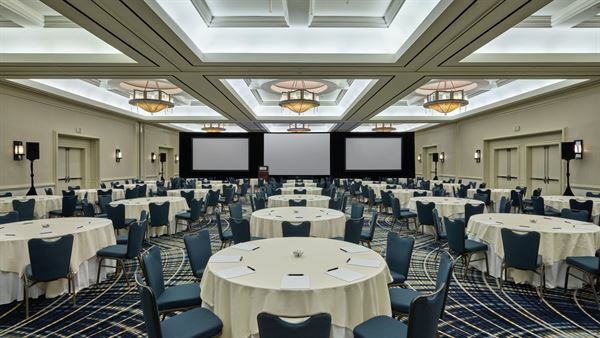 Every meeting room and event space is backed up by state-of-the-art A/V services and award-winning catering, and our seasoned Meeting Specialists will do the hard work for you, handling everything from space selection and meeting promotion to custom welcome gifts. You can also call on our on-site Event Planning Company to set up beach team-building, specialized tours and one-of-kind meeting design. Loews Santa Monica Beach Hotel is proud to be a recipient of the prestigious Gold Key Award from Meetings & Conventions magazine. Whether you’re planning a stylish corporate event, a gala, family reunion or a big birthday bash—for 9 or for 900—we’re glad you’re here. Newly remodeled, this 1,633 square feet room is conveniently located on the lobby level and can be divided into three sections, plus 922 square foot Catalina Foyer - which features floor-to-ceiling windows for lots of natural light; the foyer is a perfect private space for meal buffet setups and breaks. A space with natural light, flexible enough to accommodate dinners or meetings and can be divided into four smaller sections (2,431 square feet plus 787-square-foot Palisades Foyer). The Palisades Salon is newly renovated with new wall covering and carpet and boasts floor-to-ceiling windows for lots of natural light and views of charming Santa Monica. A recently renovated boardroom that features full A/V equipment, leather boardroom chairs with permanent seating for 14, and the perfect setting for exclusive, intimate meetings.